I'm so excited to finally post these photos of my recent collaboration with Glitter Guide + Cassidy of O My Darlings blog. It's the perfect time of year to wear tulle and although it's definitely a statement piece, it also has a lot of versatility. Cassidy took a bit of an edgy approach mixing black leather + booties, while I kept my combination romantic and girly with lace. If you haven't seen the style session yet, head on over to Glitter Guide and check it out! 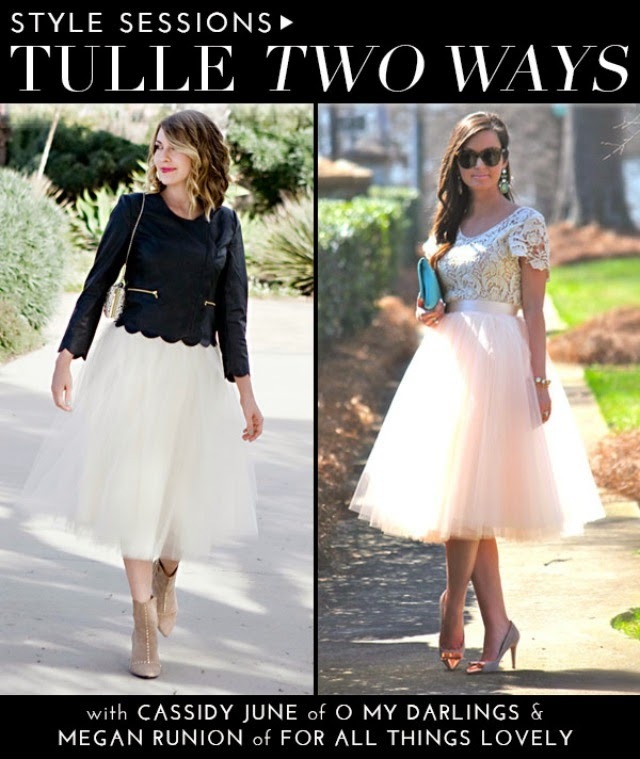 I sooo need a tulle skirt so i can be a real life carrie bradshaw even if its just for one ootd post lol! Love both looks! SO pretty! You look so beautiful in these! I love love looove this outfit & it suites you so well. Pretty, feminine and fashionable! You look so pretty! Love the tulle skirt! I definitely need to invest in a tulle skirt. It looks amazing on you! I love how you styled your skirt! It's so lovely! I've been wanting to get one forever! You styled your tulle skirt beautifully!